Om receiving a 2016 Lifetime Achievement Award for Community Service from Hon Mike Baird, Premier of NSW. Om Dhungelis a current Westpac Social Change Fellow and a recipient of 2016 Lifetime Achievement Award for Community Service, and 2012 National Volunteer Award. A Fellow of the Australian Institute of Company Directors, he is also a Director on the Boards of Settlement Services International and SydWest Multicultural Services.He currently works as a consultant and a practitioner of strength-based approaches to refugee settlement and community development. This is part of a series of interviews with not-for-profit leaders and social changemakers in partnership with Better Boards. 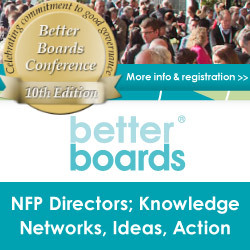 Better Boards are holding their annual conference for non-profit leaders on 29-31 July in Melbourne, the conference. They are also holding Sprout Summit a conference about using business to shape a better world in Melbourne on 29 July. Om has a unique range of Board, management, community development and volunteering experience. This is supported by a diverse educational and training background as a telecommunication engineer complemented by an MBA degree. Om was the head of Planning and Development Division in Bhutan Telecom when he fled the country in 1992. Formerly a refugee from Bhutan, Om Dhungel is the founding President and currently a senior Advisor of the Association of Bhutanese in Australia (ABA) Sydney. In the past, Om spent over six years volunteering in the Bhutanese refugee camps in Nepal, focusing his work on human rights and responsibilities, advocacy and education of refugee children. He is widely travelled and brings a global perspective in his community development work and consulting practice. Every individual, whatever the situation may be, is endowed with inherent strengths and assets. As a community and a society, we need to help create an environment where everyone can be engaged and contribute by utilising these assets. I am a telecommunications engineer by profession and worked in the government, private and the social sectors here in Australia and overseas. While pursuing my professional career, I have always volunteered and worked in the community. This has been centered around identifying talents, nurturing them and help them shine by making the most of their own potential. It is the realisation that an active and engaged community is fundamental to building a strong and harmonious society has driven me to take the plunge. My main aim in leaving my job and starting my own practice is to help empower individuals and communities, and to share a pathway, particularly to young people that no matter where you grew up or what your past circumstances was, you can choose and work towards where you want to be in future. It is about helping people to make their own track, not just following the well-trodden path, and ultimately helping them chart their own course and destiny. I have a keen interest in strength based approach to refugee settlement and more broadly community development. I am currently documenting the settlement of fellow Bhutanese refugees in Sydney. In this regard, recently I was honoured to be selected as one of the 12 inaugural Westpac Social Change Fellows. Westpac has committed $100 million and set up Westpac Bicentennial to Foundation to support such fellowships in perpetuity. The program aims to “create positive social change in Australia by investing in people who have the drive and innovative ideas to improve the social wellbeing of Australians”. As part of this fellowship, I intend to work further on the strength-based “Bottom-up holistic approach” to a refugee settlement initiative which we adopted in Sydney with highly successful outcomes. It includes travel to Norway, the United States, Canada and New Zealand to meet with experts, mentors and innovative organisations to learn from them as well as share my experience. This should also allow the exchange of ideas and experience with refugee groups, settlement providers, academics, funding bodies and policy makers. I am excited about sharing the learning by releasing it in the form of a book and to take my professional practice to the next level and impact a broader audience. The role of mentors – both formal and informal, has been very important in my life. I am a strong believer and an advocate of interdependence, the paradigm of ‘we’. On my own, I can do my very best but by working with a mentor I can leverage his or her talents and abilities and create something greater together. The first and major challenge is the decision to leave employment and be self-employed. The next thing is to narrow down and decide what area of expertise you want to focus on, especially if you have developed a wide range of expertise over the years. This then leads to real action – how to go about it. It is here the role of a good mentor becomes invaluable, guiding you along the journey. Every individual, whatever the situation may be, is endowed with inherent strengths and assets. As a community and a society, we need to help create an environment where everyone can be engaged and contribute by utilising these assets. Nothing new – it about teaching people to fish rather than giving them fish. What people, companies or organisations do you think are doing really cool stuff in your area in Australia at the moment? Little known grassroots community organisations such as the Association of Bhutanese in Australia (ABA) Sydney are taking a proactive and innovative approach to refugee settlement. By taking a holistic, strength-based approach, the initial settlement has been very successful and is helping drive social change and sustainable approach to refugee settlement and in community development more generally. Tamarack Institute (Canada) – An Institute for Community Engagement, a global leader on issues of place, collective impact, and community innovation. United Way of Calgary and Area (Canada) – The organisation gives individuals and families the opportunity to reach their potential and improve their quality of life. Its mission is to ‘improve lives and build extraordinary communities by engaging individuals and mobilizing collective action’. United Way helps in building capacity of its agency partners supports multi-partner collaborations. Businesses have an important role to play in affecting social change by working collaboratively with the social sector and the wider community in general. Westpac Bicentennial Foundation is one such great example which has taken a holistic approach in supporting social change. The bank is investing $100 million through Westpac Bicentennial Foundation which is committing to support 100 people with the ‘imagination to shape Australia’s future’ every year in perpetuity. The five scholarship categories on offer cover various sectors and scholars include leaders, innovators and pioneers – people from all walks of life ‘who have the drive to shape the future prosperity and growth of Australia’. In addition to the financial support, scholars will benefit from ongoing networking, learning and development opportunities and has the potential for a collaborative and holistic approach to drive social change. It also allows those with a passion to contribute to the country’s growth and prosperity have every chance to do so. Growing by 100 scholars a year, this network of committed individuals will connect those with bold ideas to build a better future for all Australians. Finally, if you could say one thing to people about how to make their own ideas happen, what would it be? Just do it – now is the most opportune moment.